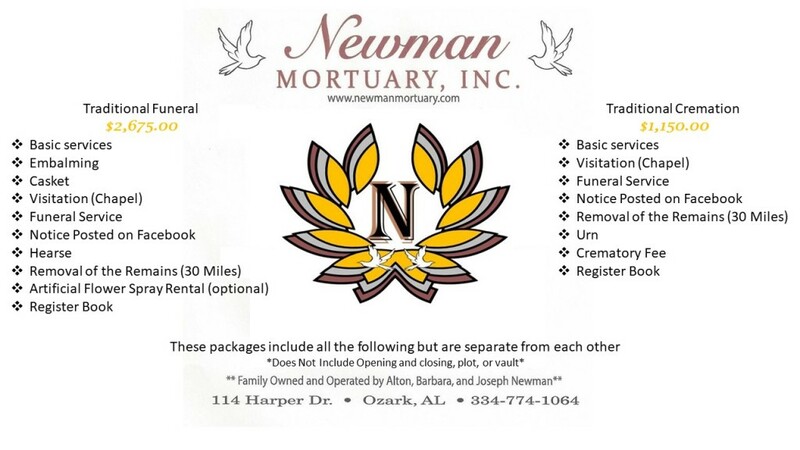 Newman Mortuary, Inc. | Ozark AL funeral home and cremation, "Serving Families With Quality Care"
Welcome to the Newman Mortuary website. We are a family owned and operated funeral home, we knowthe importance of personal attention, the genuine and compassionate care thatyour family deserves both, emotionally and financially during this most difficult time. We are here to help you. We are proud to provide our services ataffordable prices to all of our families. Every family deserves the samepersonal care, regardless of background or financial status. As afamily-oriented funeral home, we understand that the families we serve are notsimply customers, they are our neighbors. We are available to our families atall times, not just before and during the service but afterwards as well. Weoffer a variety of options to our families to create a personalized service. 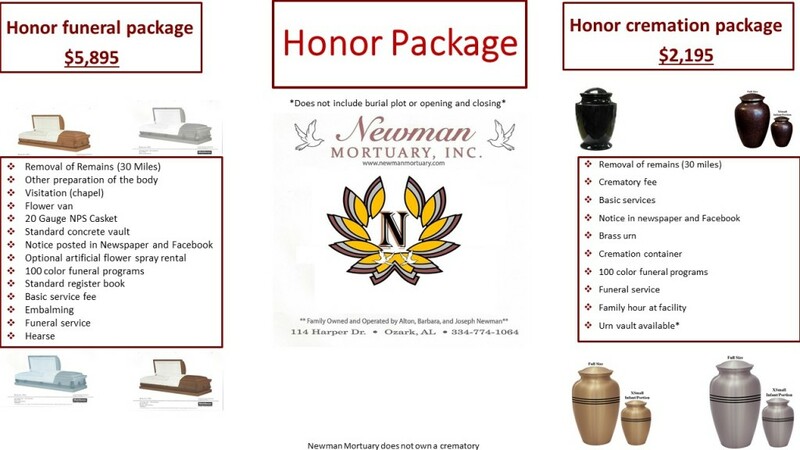 Weare committed to being one of the most professional, ethical and highestquality funeral home in the area. We have a variety of services for you to choose from to make the final moments with your loved ones as manageable as possible. We are proud to announce that we have Pre-Need Services available. 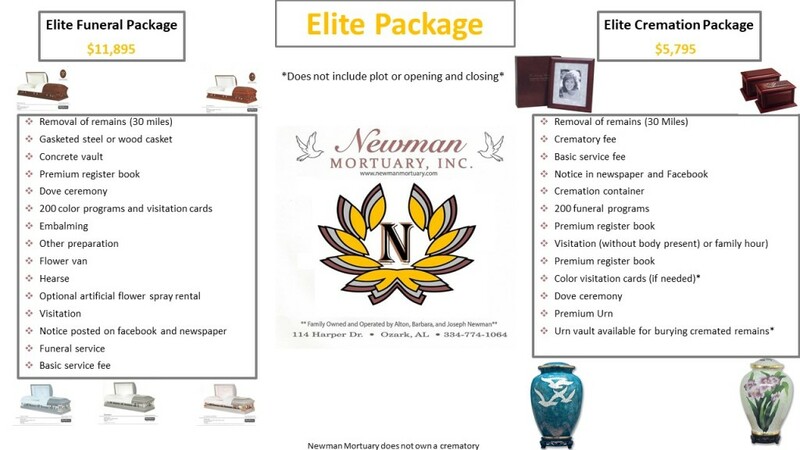 At Newman Mortuary we are happy that we can serve our families being the only black owned authorized Pre-Need sales funeral establishment in Dale County. We think that it is important that families have this resource at their disposal in order to lessen the burden on their loved ones. 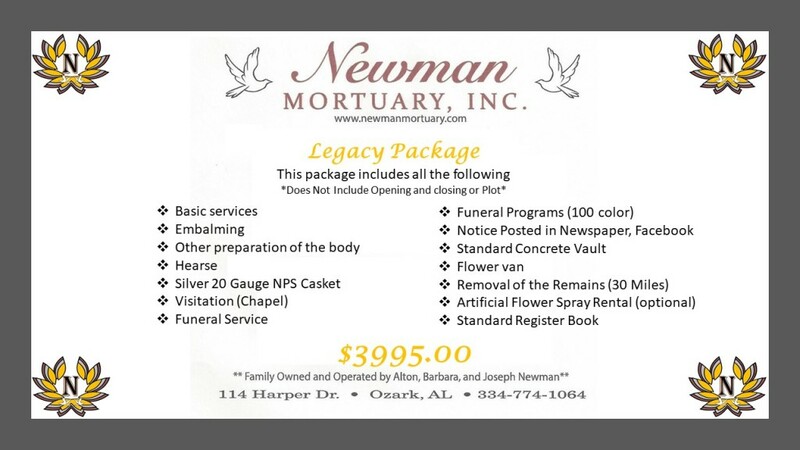 Here at Newman Mortuary we understand that letting go of a loved one can be hard. So it is with our pleasure that we offer our families a number of remembrance items in order to ensure their loved ones are remembered in numerous ways.